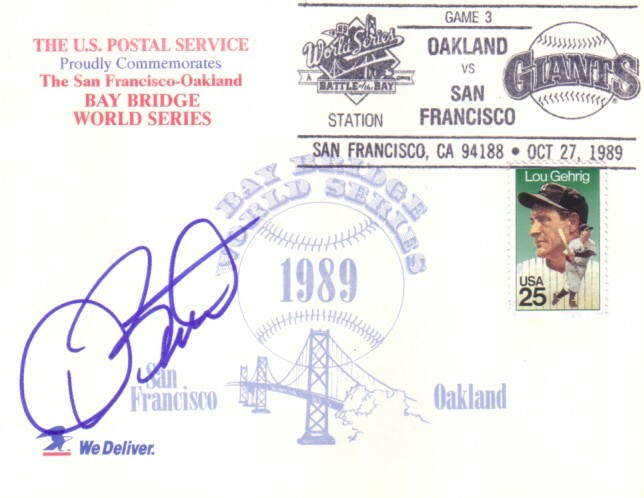 1989 World Series oversized 5 x 6 1/2 inch commemorative postcard produced by USPS, postmarked Oct. 17 in San Francisco the day Game 3 (which was postponed until Oct. 27 by the earthquake), autographed in blue marker by former Oakland A's superstar pitcher Dave Stewart, who was named World Series MVP. Obtained in person at celebrity golf tournament several years ago. With certificate of authenticity from AutographsForSale.com. ONLY TWO AVAILABLE FOR SALE.